Michael Vick’s resurrection as a football player has been truly miraculous. Not only has he changed his attitude toward life, but also his work ethic. In 2010 when Vick burst back onto the scene, people marveled at his improved ability to pass after going through an offseason of tutelage with Andy Reid and Offensive Coordinator Marty Mornhenwig. 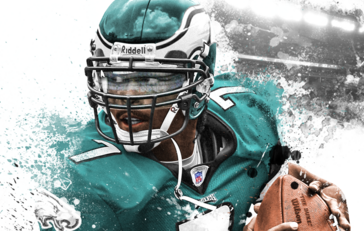 In 2011, Vick came back down to Earth; it was a horrible season, a hell storm of turnovers, missed tackles, and just bad luck for the Eagles. In looking at how to regain momentum and build toward a strong 2012 season many have said that Vick needs to improve his accuracy and overall pocket passing. While I would agree it won’t hurt to improve this element of his game, I would argue that it might hurt his overall effectiveness if they focus on it too much. What makes Michael Vick a unique quarterback? What in his skill set makes him such a challenge to defend? His running ability. 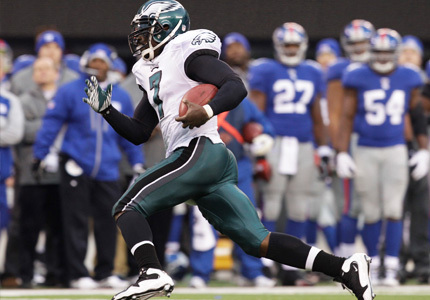 In 2010, teams were so focused on the threat of Vick running that they had to respect that possibility, which made them timid and opened passing lanes, and running lanes for LeSean McCoy. In 2011, Vick seemed to run considerably less than the previous year and opposing defenses adjusted accordingly. It was as if the Eagles released a press statement that said Vick was now a pocket passer so please try to sack him. The best way I can illustrate this point is the Eagles Miracle at New Meadowlands come from behind victory over the Giants. It was a horrible game, nothing went right, and then it went from worse to unwinnable. Down 31-10 with 8 minutes left, there’s no coming back from that. Then Michael Vick decided he was gonna run, he had two giant runs that basically flipped field position. It was as if the fabric of reality unraveled and Vick slowed down time. The Eagles scored 21 points in 8 minutes giving DeSean Jackson 14 seconds to win the game in regulation on a punt return. If Michael Vick stays in the pocket and fights the good fight, the Eagles don’t win that game. Vick is not Tom Brady, he will never be Tom Brady, don’t try to make him Brady. He can be a very good passer and an amazing runner; it’s the combo that makes him a deadly threat for opposing defenses. For anyone wanting to argue that Vick running exposes him more to injury think about this. 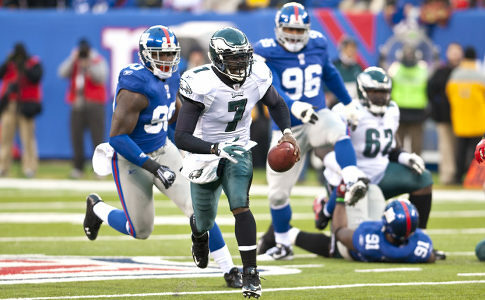 Vick is a true athlete; he gets tackled in stride very often and keeps popping back up. In 2011, when he got injured it occurred in the pocket. When Vick is moving he is elusive and tough to bring down, when he is standing and scanning the field he is basically a sitting duck. If the Eagles want the most opportunities for success they must make an effort to get Vick running, even if it’s on broken pass plays. If it’s not there, run. Think of how many times Vick scampers for a 10 yard gain when he gets out of the pocket. That sounds like a lot of long drives to me. Take the yards, score some touchdowns, and make the opposing defense unsettled. What do you think about this topic? What run-pass ratio do you think is right to keep the defense unsettled?